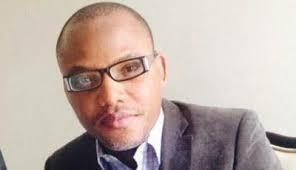 The State Security Service on Monday asked an Abuja magistrate court to discontinue its case against the leader of the Indigenous People of Biafra, IPOB, Nnamdi Kanu. Mr. Kanu was arraigned for criminal conspiracy, engaging in unlawful society and criminal intimidation, which violate Section 97, 97B and 397 of the penal code. The presiding magistrate, Usman Shuaibu, had issued an order for the bail of Mr. Kanu on the condition of presenting a surety of Grade Level 16 with a landed property in Garki or Wuse areas worth N20 million. On resumption today, the prosecution counsel, Moses Idakwo, told the court the accused person was yet to fully meet the requirement for his bail. He explained that the reason for Mr. Kanu’s continued detention in the custody of the SSS was his inability to fully meet the requirement for bail. He told the court that although the service had confirmed the office of the surety presented by the accused, the location of the surety’s plot was yet to be ascertained. Counsel to the defense, Vincent Obete, however informed the court about the affidavit before it, noting that the prosecution refused taking the necessary step to confirm the location of the surety’s plot of land. “If it takes this long to confirm a mere location of a plot that is just next door to us in Abuja here, then we are in trouble,” said Mr. Obete. Mr. Idakwo however told the court that the SSS had stumbled upon fresh information that had made the case outside the jurisdiction of the magistrate court. He therefore made an application based on section 108 sub section 1 of the Administration of Criminal Justice Act, that the case be discontinued and taken to a more appropriate court. 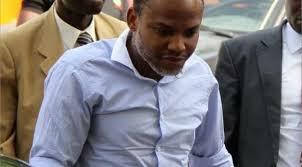 In response, another defense counsel, Jude Abojeh, said the court had given several orders to the SSS to release Mr. Kanu on bail to no avail. He noted that “whoever wants to come to justice should do so with clean hands”, saying since the SSS was asking for the discontinuation of the case, they should first comply with the orders of the court. He also told the court that Section108 referred mainly to a directive by the Attorney General. “Your Lordship, there is no such order from the AGF before the court,” he countered. He argued that an order was pending before the court to be obeyed by the prosecution counsel, hence the prosecution could not bring an application before the same court it had disobeyed. Mr. Idakwo however argued that the section made a provision for an alternative if an order was not made to the AGF. He said his client did not compulsorily need to get a directive from the AGF. The magistrate therefore said he had taken note of all the proceedings concerning the disregard of his orders by the prosecution counsel when he asked for the confirmation of the location of the surety’s plot of land. He added that he had already signed the affidavit from the defense counsel noting his refusal to confirm the location of the surety’s plot. He said the court would look critically into the various applications and counter applications before coming up with its ruling. The case was therefore adjourned till December 1 for ruling.